What would happen if 50 million people were praying the same prayer and declaring God’s promises together everyday? Would it make a difference to God? His word says it does, “…if two of you agree on earth about anything that they may ask, it shall be done for them by My Father who is in heaven. 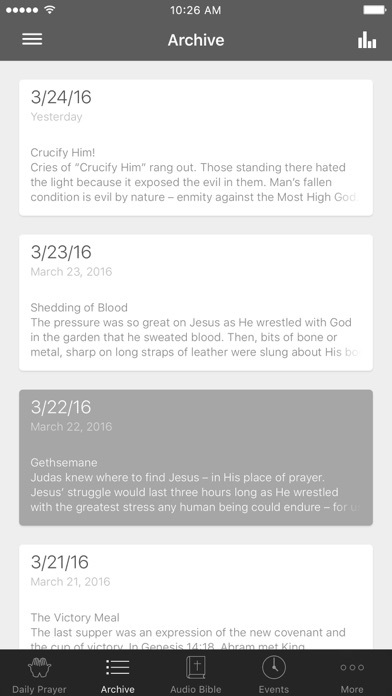 For where two or three have gathered together in My name, I am there in their midst.” Matthew 18: 19-20 This app will provide you with a devotional, a scripture, and a prayer – tools to get you started in spending 15 minutes (or more) with God. Let’s link arms and believe that praying together WILL make a difference. Give Him 15 minutes today, tomorrow, everyday. 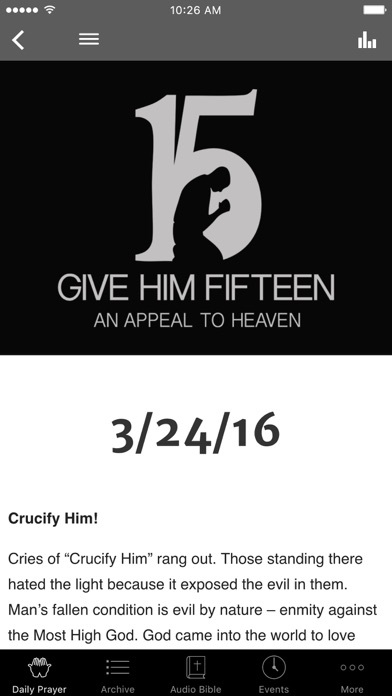 The Give Him 15 App was created with the Subsplash App Platform. I love this app and have used it nearly every day for the past several months. Just the last few days, it will not open. I tried deleting the app and reinstalling, and the day’s prayer appeared but it would not allow me to scroll or select any other menu options. It looks frozen. Help!! I recommend this app for a guide to powerful daily prayer for our nation with a focus on current events now happening in our government. It is full of hope and is positive in nature. It helps me focus on God's perfect plan instead of all the bad news. Is this a prayer tool or a political platform?!?!? Come on!!! I thought for once I could escape the political BS and this could be a helpful app/tool for that. NOPE!! Don't waste your time. Great prayer tool! Love the app, only wish there was a way to adjust the type/font size for "older eyes," or the ability to "pinch" to zoom in (on my iPad or phone). Overall, I like this app. The notifications don't work properly. The only thing I get is a button which never goes away. No other notifications occur. Just needs a little tweek. Helps me direct my prayer everyday. I really like the audio bible. I can listen and read it simultaneously! I like the app and use it almost daily. What I don't like is a red #1 on the app icon that won't go away. Can you fix this? Thanks! This is a great "short" devotional that keeps our prayer focused and our decrees on point! This is a great app. I love the reminders is gives of the crucial aspects of our walk with Christ. Anything that causes us to think and meditate on God's word, and anything that encourages us to spend time with the Father is worth having! I've been using this app for a few weeks and I believe it is effective in helping me target my prayers. It also brings to light issues in our nation and the world that I am not always aware of. Thank you for providing this app! May the Lord richly bless you!